Last week I helped out at Richmond Survival Camp. Well "helped out" might be too strong a phrase. Mostly I sort of stood around and occasionally said stuff. It was nice. This is what I wore that whole time. I had vague notions of changing my outfit from time to time but then I was like, nah. 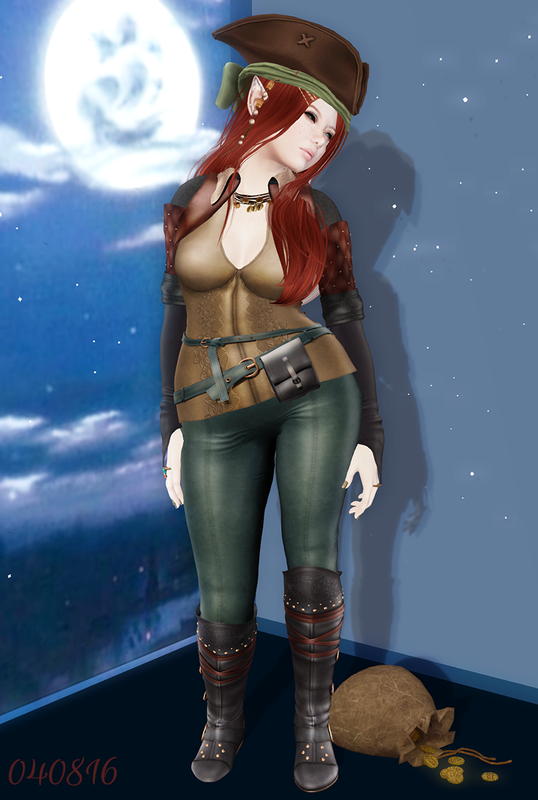 The majority of my outfit is from a gacha by FDD Stories, which was in last year's pirate-themed Fantasy Gacha Carnival. I bought it all on the Marketplace because...I wanted it all. The hat is from the Alchemy gacha which was at the same event last year, as was, I'm relatively certain, the necklace by ieQED. So the moral of the story is, time travel back to that event for all your pirate needs!